One day a man on horseback came, racing into a small town on the frontier. And he yelled out, “Big Jake is coming! Big Jake is coming!” And so all the townspeople were terrified; they ran to their homes and bolted the doors. They closed up their windows, and children were sent to hide under their beds. In the saloon, the bartender was still boarding up his windows, when suddenly, in walked the biggest man he had ever seen. The man had strips of bullets draped across his chest, and strapped to his legs were two of the biggest guns that the bartender had ever seen. And the man was dressed in black, and he looked incredibly mean. Many people thought that John the Baptist was the one who they had been waiting for. They thought he was the Savior that God had promised to send. John was very popular and many went out to the wilderness to listen to him preach. But time and time again, John told the people that he wasn’t the one. Instead, he said that he came to prepare the way for the Savior who would be arriving soon. John preached a message that was quite simple and straightforward. He called on people to repent and to believe in the one who was coming. John was a pointer – he was pointing to the one who was coming, one greater and more powerful than he. John was saying, “Here’s the one God has promised to send us. Here’s the one to follow, here’s the one to look to for grace, for salvation, for guidance, for help. Don’t look to me for those things, look to the one who will soon arrive. That is what repentance means, it means to turn our attention, our minds, our hearts, and our strength to following the one whose birth we celebrate this Christmas, our Lord Jesus. But for many people, the call to repent falls on deaf ears. It’s kind of like how people tune out the emergency instructions that the flight attendants give on airplanes. Most people on board are usually looking out the window or reading a magazine or maybe even falling asleep. I’m looking at the Sky Mall Catolog, dreaming about things I want to buy, and my wife elbows me and says, “pay attention!” The problem is, that if there should happen to be an emergency on board, there isn’t time to go back and to have the flight attendant repeat what she has already said. It’ll be too late. That call to repent is simply the invitation to change the directions of our lives. Repentance literally means to “turn around” or “change directions.” We’ve all seen signs when traveling that say “Road Construction Ahead.” Sometimes it means there’s going to be some twists and turns in the road, or a lane will be closed, or there may even be a detour ahead. One time, when I saw road construction on Highway 14 heading toward Rochester, I had to take a detour and drive on a completely different road, in what seemed like the exact opposite direction I wanted to go. 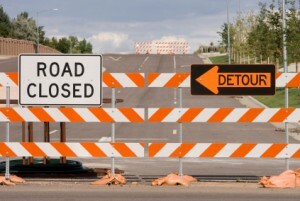 Road construction and road detours are a picture of repentance. God may call us to make some small re-directions in our lives to get us on the right path. Or, God may call us to change the entire direction of our lives. What repentance does mean is to admit to God our mistakes, that we have gotten onto the wrong road in life, and to seek God’s help to get on his path for our life. I know for me, there are times I try to feed both of them. Sure, I try to do some good things with my life. But at the same time, I like keeping that evil wolf around as well. But John the Baptist is telling us that we can’t keep both of them. So repenting is not something we have to do to placate God’s anger. Instead, repenting, changing our ways, is something we get to do and are glad to do, because God loves us and is helping us to get on the right path in life. And from what we read here in the Gospel of Mark, it seems that when the people heard John’s message, they did repent. They came to him at the Jordan River, they confessed their sins, and they were baptized as a sign of their new way of life. This wasn’t baptism like we have in the church, although the symbolism is similar. For the 1st century Jewish believer, baptism was seen as a kind of cleansing bath, as a sign that they were “washing away” their old life of sin, their old life of unfaithfulness to God, past behaviors of which they were ashamed. And so, they put their whole body in the water, symbolizing that the old life had been completely washed away, and they came out of that water ready to live a life of obedience to God. Our baptisms are not the same as John’s Baptism. But what we can do is to remember what our baptism means. Our baptism means that God washes away our sins. We are forgiven. And our baptism means that God makes a commitment to us, to help us get our life on a new path, on God’s path, a path of following his will for our lives as revealed to us in Jesus his Son. So, there we have it. As we celebrate this Christmas season, remember this call of John to repent. This call to repent says that our lives are not created to be our own. We are created to live in Christ and to walk in obedience to his ways. The crowds who heard John got ready to follow Jesus, and we are called to do the same.